We are all indigenous to somewhere. Wherever we might have come from originally—our community, our neighborhood, our village, our barrio—we call that home. For many of those who live in the Arctic National Wildlife Refuge, it has been their home for generations unknown: generations that lived in accordance with the instinctual calendar and movement of the indigenous wildlife. They did not impose themselves on the face of the land; they were part of nature, living among, not over. Drilling is not indigenous. Drilling is an aggressive invasive species. It displaces, disturbs, and devours nature. It is our responsibility to understand that we wouldn’t let this happen to our own home, so why would we stand by and let it happen to those whose subsistence depends the most on preserving the delicate balance of the wild? America’s Arctic is a breathtakingly natural, wild place, and right now we have the power to faithfully preserve it so that those who live there can thrive and our families can experience and enjoy it. I have been given the opportunity to exult in the vast beauty of the Arctic National Wildlife Refuge firsthand, and it would be selfish of me to not work to ensure that future generations have that same opportunity. 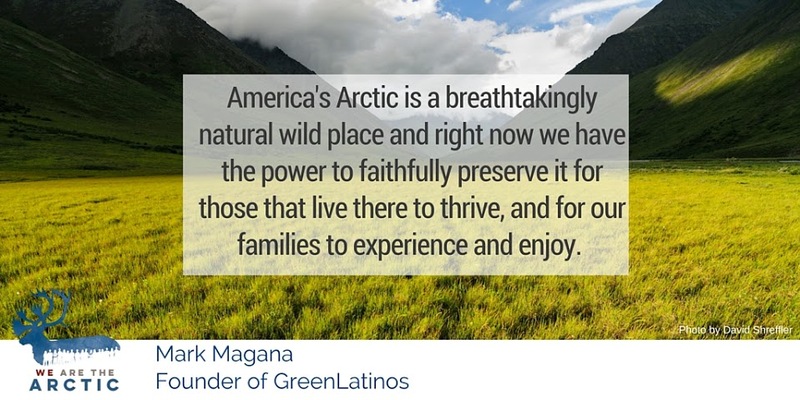 Mark Magaña is the president and founder of GreenLatinos, a national coalition of Latino environmental, natural resources, and conservation leaders. The first Latino to serve as senior staff at the White House and in Congressional leadership, he was special assistant to President Clinton for legislative affairs and senior policy advisor to the House Democratic Caucus vice chair Robert Menendez. Hear Mark explain in a video why he's joining conservation and religious leaders, Alaska Natives, communities of color, outdoor enthusiasts, veterans and communities of faith from across the U.S. to protect the Refuge.